Today is April Fool’s Day, aka Switcheroo day. That’s when the DT artists switch comics for a day. You can find all of the switcheroo comics, including Sammy’s, at the 6 dollars, please blog. Last year I traded off with Smoothie Home, but they aren’t rolling with the DT anymore, so I thought I’d change it up a little. This comic is my take on Crippling Disappointment, which is written and illustrated by my good friend Hannah Chung. Her story centers around a girl who has a really hard time making friends, and experiences serious bummers on a day to day basis. 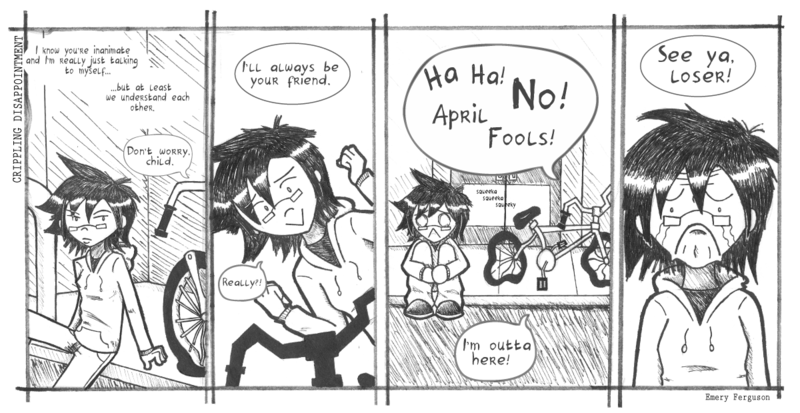 The fail bike is sort of a running joke in her comic, but hopefully it stands alone well enough for you to appreciate this one. In her comic, this sad looking bike is being mocked by passerby because it is so broken down that none of the usual thieves and drag rats want it, so the protagonist decides to chill with it for a while. My premise is simple: What if that bike was a douche bag? XD OMG LOL!!!!! That is too good!